Peeters sketched out the Lied Symphony during his second concert tour of the USA in 1947, and completed it the following year. Inspired by the awe-inspiring landscapes of the American continent, the work was conceived as ‘a symphonic Benedicite’, a hymn of gratitude from the artist to the Creator: Benedicant te coeli, terra, mare et omnia quae in eis sunt (Heaven, earth, sea and all that therein is bless thee). Its five ‘Lieds’, or songs of praise, portray ocean, desert, flowers, mountains and sun. 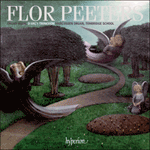 Lied to the Flowers was first sketched in California; a lyrical theme in free rhythm flows gently through a varied sequence of delicate textures and colours, evoking an idealized world of ‘flowers and fruit, warm earth and cool grass’. Esquissée par Peeters lors de sa deuxième tournée américaine, en 1947, la Lied Symphony fut achevée l’année suivante. Inspirée par les impressionnants paysages du continent américain, elle fut conçue comme un «Bénédicité symphonique», une hymne de gratitude de l’artiste au Créateur: Benedicant te coeli, terra, mare et omnia quae in eis sunt (Le ciel, la terre, la mer et tout ce qu’il y a à l’intérieur te bénissent). Ses cinq «lieder», ou chants de louange, peignent l’océan, le désert, les fleurs, les montagnes et le soleil. Lied to the Flowers fut ébauché en Californie; un thème lyrique en rythme libre flue paisiblement à travers une séquence variée, aux textures et aux couleurs délicates, évocation d’un univers idealisé «de fleurs, de fruits, de terre chaude et d’herbe fraîche». Peeters skizzierte die Lied Symphony 1947 während seiner zweiten Konzerttournee in den USA und vollendete sie im folgenden Jahr. Sie ist von den Ehrfurcht gebietenden Landschaften des amerikanischen Kontinents inspiriert und wurde als „sinfonisches Benedicite“, einer Dankeshymne des Künstlers an den Schöpfer konzipiert: Benedicant te coeli, terra, mare et omnia quae in eis sunt (Loben mögen Dich Himmel, Erde, Meer und Alles darinnen ist). Die fünf Lobeslieder porträtieren Meer, Wüste, Blumen, Berge und Sonne. Das zunächst in Kalifornien skizzierte Lied to the Flowers hat ein lyrisches Thema, das in freien Rhythmen sanft durch eine vielfältige Folge zarter Strukturen und Farben fließt und eine Idealwelt von „Blumen und Früchten, warmem Erdboden und kühlem Gras“ heraufbeschwört. Dedicated to the legendary American virtuoso Virgil Fox, Lied to the Sun is the last and the most spectacular of Peeters’ three great organ toccatas. Two heroic themes weave their way through this resplendent hymn to the natural and the supernatural light, accompanied by a dazzling array of dynamic semiquaver figuration. The stark modality of the opening pages is warmed by richer harmonic colouring in the extended central section, building up to an even more brilliant reprise. Dédié au légendaire virtuose américain Virgil Fox, Lied to the Sun est la dernière, et la plus spectaculaire, des trois grandes toccatas pour orgue de Peeters. Deux thèmes héroïques se faufilent à travers cette resplendissante hymne à la lumière naturelle et surnaturelle, accompagnée par un saisissant éventail de dynamiques figurations en doubles croches. Dans la section centrale prolongée, l’austère modalité des pages inaugurales est réchauffée par une coloration harmonique enrichie jusqu’à atteindre une reprise plus brillante encore. Das Lied to the Sun, die letzte und spektakulärste von Peeters’ drei großen Orgeltokkaten, ist dem legendären amerikanischen Virtuosen Virgil Fox gewidmet. Zwei heroische Themen winden sich durch diese strahlende Hymne an natürliches und übernatürliches Licht in Begleitung einer überwältigenden Folge dynamischer Sechzehntelfiguren. Die nüchterne Modalität der einleitenden Seiten wird im erweiterten Mittelteil durch reichere harmonische Färbung gewärmt, um sich dann zu einer noch strahlenderen Reprise aufzubauen.